This page gives some short description of my Electronics Projects which I've made in the past. Some of them will be very complete - because I still have them; and some of them I wrote just down to not forget them, because they are all lost. The projects from where I still have a lot of information, do have their own pages, the others have just a small description on this page. This was my very first radio. It was a small kit to build "Step by Step" a transistor radio. This kit was from the Dutch company "AMROH". I used it for many years, to listen in bed to the radio. It had a nice blue housing. After it was broken, it was still used; a good place to put my glasses on. This was a design of Philips made in about 1962. 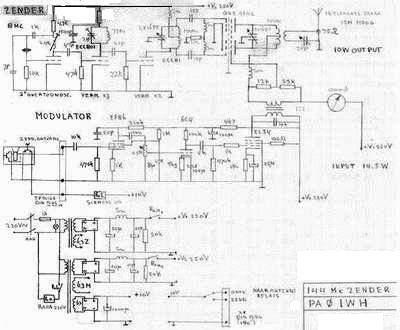 It was a receiver for the Radio Amateur Shortwave bands, the 80, 40, 20, 15 1nd 10 meter bands. This was built after I got my licence. It used Amplitude Modulation. There is no photo, only a bad copy of the schematic diagram. The power tubes were QQE 03/12. Don't use this diagram to make a new one. Around 1971 we got the first series of TTL IC's from Texas Instruments. But what to do with these very nice looking black things? Since I was always interested in clocks, I decided to make a digital clock. Now, in 2008, it is still up and running without any problem. This Infra Red Remote Control was made in 1983. Therefore some of the components may look a bit outdated. The intention was to make an example application for a small single board computer, in this case with an MK14.